Acronym Lutherans | "Northern Crossings"
There is an old joke that made the rounds back in the day. It was a take off on Jesus words – Matthew 18:20 20 “For where two or three gather in my name, there am I with them.” The joke was that wherever 2 or 3 Lutherans get together there is a split. There are a dizzying array of different Lutheran Churches. In one town that I know of there are two ELCA Churches across the street from one another. In another place I visited there were four Lutheran churches located in walking distance of one another. There was an AFLC, ALC, LCMS and AALC church literally within shouting distance of one another. I am told, although I can’t prove it, that there is a city where two Lutheran churches share the same parking lot but not the same building. It makes for some interesting questions and sometimes some funny historical facts but it is still confusing to the average person. It is confusing to some Lutherans too. Someday we will have to try and sort out why that is so. I have a book somewhere that shows a tree graph type of thing that shows how all these Lutheran churches started, converged, merged, split and some disappeared. It looks more like kudzo than a tree, but it is nevertheless, fascinating. 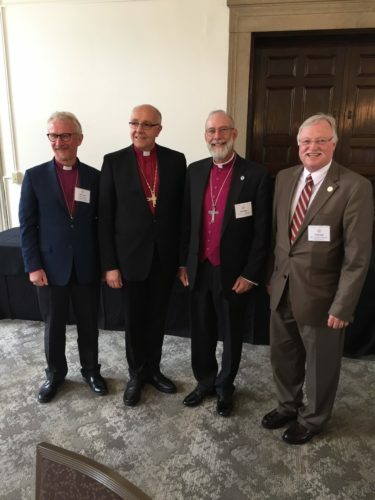 Recently in Minnesota a convention was held of the AALC – the Association of American Lutheran Churches. Guests came to the event and among them were Bishop Torkild Masvie of Lutheran Church in Norway and Bishop Hans-Jorg Voigt SELK. The SELK is the confessional Lutheran, some say the “Old Lutheran Church” in Germany and we will explain that later when we talk about how these churches came to be. The Presiding Pastor Curtis Leins of the AALC, is what we would call the President. The fourth in the quartet above is Rev. Fondow of Minnesota North who I believe is representing the LCMS. The AALC means American Association of Lutheran Churches. They are a partner church of the Lutheran Church Missouri Synod. This from their official website. The AALC and The LCMS have joyfully decided as two independent church bodies to enter into a partner church relationship recognizing each other as separate but interdependent church bodies in Christ. We gratefully acknowledge that this partnership is based on our common public confession of the Gospel of Jesus Christ as taught in the Holy Scriptures and confessed in The Book of Concord. Each of our churches confesses an unconditional commitment to the Holy Scriptures as the inspired, infallible and inerrant Word of God and to the confessional writings of the Evangelical Lutheran Church in The Book of Concord as a correct exposition of the Word of God. We congratulate the AALC on their convention and pray that God would richly bless them and the proclamation of the Gospel. We appreciate the fact that here at least, we see a model of how churches should define fellowship and partnership and it is by an adherence to the Word of God, the Sacraments and their proper administration, and the unaltered confessions of the Lutheran church. We are going to start a series of blogs on “why so many Lutherans” soon. Believe it of not this has a bearing on mercy as well. Tomorrow we will have an example on what happens when a Government tries and make churches get into fellowship with one another. Lent and the Peaceable Kingdom.